Armed with her favorite Martin guitar, Sera Cahoone’s music reflects her love of both old country-western and modern lo-fi. Her unique sound bridges the gap between the two genres, like a musical love child of ‪Buck Owens and ‪Cat Power. Sera Cahoone’s self-titled debut album tells the quiet story of simple truths – heartbreak, longing, and self-discovery. The ten songs feature a wide array of sounds including pedal steel, banjo, dobro, violin, and harmonica, and was recorded with the help of band members past and present - Jay Kardong, Jeff Fielder, Eric Himes, and both Sarah Standard and ‪Mat Brooke from Sera’s old band - Carissa’s Weird. 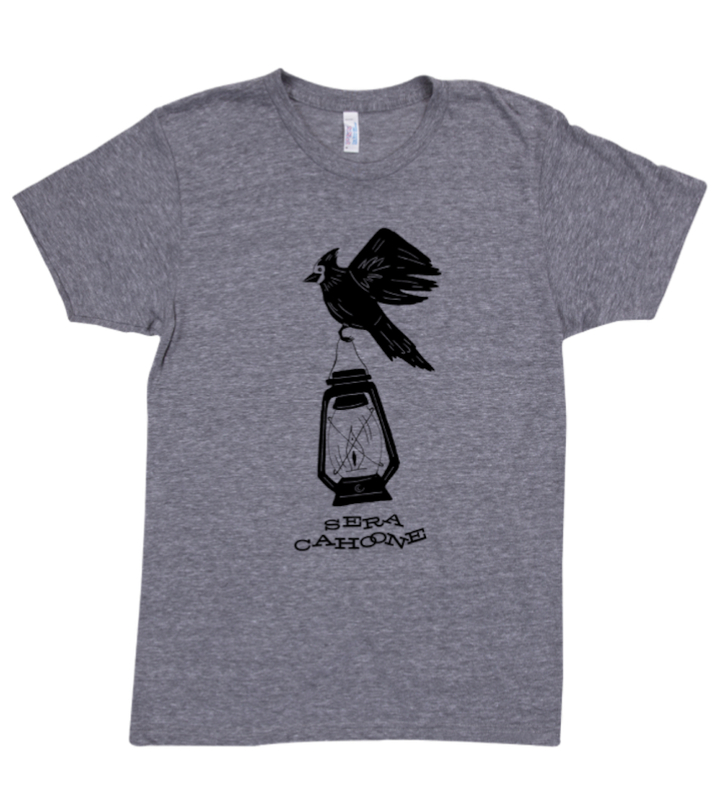 Sera Cahoone was originally released in 2006, and the Sera Cahoone LP will be released on vinyl for the first time August 17th, and all pre-sale orders will be autographed. Sera Cahoone and Alex Guy. Photo by Hilary Harris. Across her four critically-acclaimed albums, Seattle artist Sera Cahoone has become known for creating stirring, hushed Americana music that embodies raw emotionalism. Her songs have always been the sort that grab the listener by the collar and pull them close. And yet fans may not even realize they’ve yet been held at arm’s length until they hear the revisited arrangements on her new, forthcoming EP, The Flora String Sessions, due for self-release on April 20, 2018. The Flora String Sessions revisits some of Cahoone’s most beloved fan favorites from across her remarkable career, with just her starkly honest vocals and guitar plus violin, viola, and cello. It’s somewhat of a greatest hits collection, albeit with more intimate, stunningly beautiful arrangements by Led to Sea violist Alex Guy. The trio Guy assembled to support Cahoone on this effort serves to augment the space between notes, drawing the listener into the essence of heart-rending selections like “Couch Song” (from 2006’s Sera Cahoone), “Baker Lake” (from 2008’s Only as the Day Is Long), and “Worry All Your Life” (from 2012’s Deer Creek Canyon). Cahoone has always been a master of intense lyrical intimacy. And while her exquisite live band has provided her previous recordings with lush, intuitive instrumental support, there is something remarkably pure about hearing some of the best songs of her career delivered in this more nuanced manner. As she has steadily gained a wider audience over the past twelve years, the Denver-native-turned-Seattle-mainstay has toured with Son Volt, Kathleen Edwards, Blitzen Trapper, and Gregory Alan Isakov, to name a few; but it was a duo tour with Guy that set the pair spinning toward this project. In 2017, they set out for a brief tour of the Southern US, which quickly grew into a five-week jaunt out West. Once Guy had arranged violin parts for that outing, it seemed natural to her to expand them into string trios for a special performance back home at Seattle’s Saint Mark’s Cathedral. To prepare for that evening, the pair combed through Cahoone’s back catalogue to determine which songs would best lend themselves to being played with a trio. Once they had nailed down 16 songs for the set, Guy spent the next few months completing the arrangements. “Each of Sera’s songs has its own beautiful character,” she notes. “It was a challenge and a real pleasure to try and bring that character even more to life through the string parts, … without overwhelming the beauty of the original guitar and vocals. But, she adds, “the best moment for me was at our first rehearsal with the string trio. Sera hadn't heard any of the arrangements live yet and I really wasn't sure what her reaction would be because there were so many new elements that she wasn't used to. At the end of each song her eyes were on fire, and she'd say 'Woah! That was awesome!' I knew I'd been on the right track." "Cahoone has lost none of her easygoing approachability along the way; her songs still amble sweetly and gently, propelled by a voice that radiates kindness. But, starting with "Always Turn Around," From Where I Started tackles personal realities in ways its predecessors generally didn't." "LADYBUG" STREAMING PREMIERE AND INTERVIEW ON NPR MUSIC'S "SONGS WE LOVE"
"Singer-songwriter Sera Cahoone, whose reflective songwriting posture and moony, mellow lilt have made her a big draw in the alt-country scene of the Pacific Northwest, reverses that dehumanizing process in the song "Ladybug," a melancholy twang-pop number from her upcoming album From Where I Started." ELLE MAGAZINE'S "BEST NEW SONGS FOR MARCH" PREMIERES "BETTER WOMAN"
"The singer-songwriter writes intimate tunes full of lulling melodies and complicated grace, as heard in "Better Woman,"
The 11-song cycle finds her returning to her DIY musical roots, after releasing three albums via Sub Pop and serving as a drummer with Band of Horses and Carissa's Wierd. It also finds her parsing what it means to be alive, through heartache and hope … emotions that are infinite, unforeseen, and always in season, no matter who you are.